The tallest dam in the world might come up on the border between India and Nepal. More than 30,000 families would be affected. People protest in the Himalayan Day to denounce dam building in a seismic prone fragile zone. Pancheshwar is the biggest dam to be planned in Uttarakhand under a commitment made by India to Nepal under the 1996 Mahakali Treaty. The long-pending project got a fillip when Prime Minister Narendra Modi visited Nepal in 2014. A Pancheshwar Development Authority was set up consequently to finalise the project. The project is to come up near the Pancheshwar temple, 2.5 km downstream of the confluence of the Mahakali and Sarju rivers. It entails two dams working in tandem. The main Pancheshwar dam would rise 311 metres and the second one downstream would be 81 metres high. The project is expected to submerge 11,600 hectares of mountain area – a land mass larger than Chandigarh (11,400 hectares) – in five seismic zones. Of this area, 7,600 hectares would lie in the three districts of Uttarakhand and the rest in Nepal. In all, the authorities plan to acquire 9,100 hectares of land in Uttarakhand and 5,000 hectares in Nepal. According to project developers, close to 30,000 families spread over 62 villages in Uttarakhand stand to lose their land. They have not yet assessed how many livelihoods would be impacted. 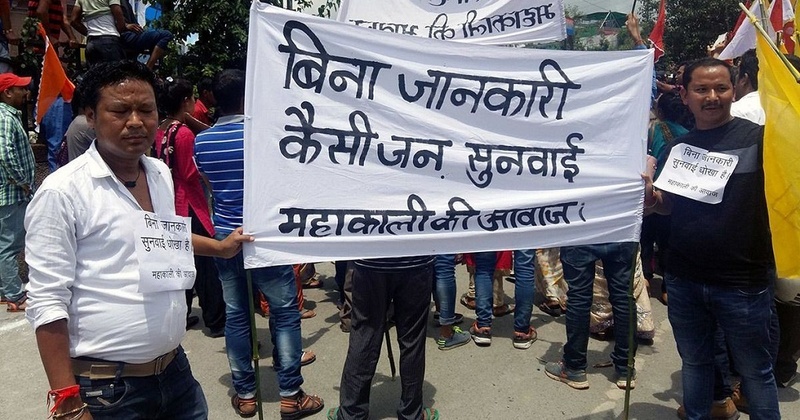 Serious questions were raised by activists questioning the process of compensation and the clearance process and the logic of holding public hearings during the monsoon (see social movements' declaration further below), and documentation provided only in English (while Hindi is the local common language). There's a large number of environmental concerns as well, listed by SANDRP in a letter to the Experts Appraisal Authority, including threats to habitats of endangered species like the tiger . Why? Explain briefly. It is still at the project stage. India/Nepal: a preliminary ecosystem services assessment of likely outcomes. The Hindu (updated 2 Sept 2016), Environmentalists oppose Pancheshwar dam. Kavita Upadhyay. "The bilateral talks between Prime Minister Narendra Modi and Nepal Prime Minister Sushil Koirala during the former’s recent Nepal visit included an agreement to restart work on the 5,600 MW Pancheshwar multipurpose project. This has aroused strong opposition from environmentalists and anti-dam activists." Rupak D Sharma of The Himalayan Times caught up with PDA CEO Mahendra Gurung to know more about findings of study conducted by WAPCOS. The public hearing for Pancheshwar Dam of khumao area of Uttarakhand held on 9th of August 2017, at a hall in Barakot block of Champawat district proved to be a fraud for the people of the valley and environment. What will happen when without obtaining true knowledge, there is an attempt to understand what will be the benefits of dam? What will be the impact on the environment? What about the displacement? What about the rehabilitation? What have the governments done till date? Only the work of big data, investment of big money and selling of big dreams and the paper work of public hearing has been done for the sake of doing. People of the valley knew nothing about the environment impact assessment, social impact assessment and management plan. So there is no question of them reading about all this. On the dice of the public hearing people were not able to make out about the panel of the public hearing. MLA of the area, Block head Lohaghat, Barakot and the representative of the MP were present. To register the objections of the people there was a counter made much away from the public hearing venue. The people of the valley presented very superficial questions in front of the panel. Some villagers raised questions only related to land, house and compensation etc. The panel members kept repeating about the rehabilitation and gave assurance which had nothing to do with the public hearing. It appeared as a pressurizing technique being applied on the villagers. It was an attempt to present assurance in the name of rehabilitation. Public hearing happened in a closed hall. There was an arrangement of a display TV for the people standing outside to listen to the public hearing. But it was announced from the dice that those who have queries can go out, which was not correct on the part of the panel. A woman ADM was roaming in the hall and was continously giving instructions to the people present. It was not possible for the people of 26 villages to come this far. The views of the people were taken on displacement by going to the villages. The number of government officials in the public hearing was quite big. 2 platoons of PAC (almost 90 personnels) and 60 to 70 personnels of local police were present at the venue. It appeared as if some valuable commodity was being auctioned. Police officers were also present inside the hall of the public hearing, and tried to man handle Omkar Singh Dhauni by grabbing him by the arm and trying to stop him. Omkar Singh Dhauni asked question about the process of the public hearing that when did the officials presented the synopsis of the papers related to the project on the village level? In his village- Pancheshwar it was given only four days ago. In the distant villages even newspapers are not available so how can the villagers read the notifications on the website? In the public hearing people were repeatedly told that it is just the beginning of the process and we will hear your queries. Whatever will be the issues of this public hearing, that will be considered in the end of the environment impact assessment report. Discussion on environmental impact was only for the namesake. The questions put forward by the environment activist Arun Singh were also not answered correctly by webcos. Vimal Bhai was interrupted till the end and was not able to put forward his views. His first question was that who all are the members of the panel? In reply the district magistrate said that you should not raise legal questions. When asked that why the news of legal papers and public hearing reached so late in the villages, no answer was provided. When asked that if any official present in the hall have read the 900 page long report? If not, then how can they expect from the villagers of the distant villages to read them, who don't even know if any document like that exist. No answer came on this question too. For the forest clearance of Champawat district, the no objection certificate taken from the villagers, by running a village level process was done in a lot of hurry. On this the DM said that it was all together a different process and it was done that way to save time. On asking, webcos replied that the process of preparing the papers and public hearing was completed in Nepal. 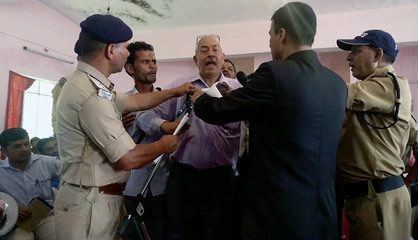 In the end Vimal Bhai stated that all this process is flawed and the people were kept in dark. Chairman of the public hearing, the District Magistrate was requested to nullify the process altogether. On this the people's representatives present on the dice became aggressive but the DM stopped them. Representative of the webcos kept repeating that the people were fully informed. In the public hearing the webcos representative kept on replying to the questions which should have been replied by the government officials present there. 1. The public hearing held in Champawat on 9-8-2017 should be nullified. And the public hearing to be held in Pithauraghad(11-8-2017) and Almoda(17-08-2017) should be immediately cancelled. 2. The environment impact assessment, social impact assessment and the management plan should be presented in easy hindi language to the villagers and this task should be given to an impartial organisation working in the field of environment. 3. Venues of upcoming public hearings should be kept inside the area of the impacted villages. 4. The public hearing should be kept after the monsoon season only. 5. No heavy use of police force in the public hearing and only panelists should be present in the panel and other people should not be sitting with the panel.